With our increasingly active lifestyles, it's getting more and more difficult to get a good night's sleep. While it's widely suggested that adults need 7-8 hours of sleep every day, many of us don't manage to hit that number all the time. When you do manage to get a proper night's rest, you'll find yourself waking up fresh, energised, and ready to tackle the day. However, actually sleeping properly is easier said than done. While nothing short of medication can truly force you to fall asleep, there are gadgets that can help. One such device is the Rs. 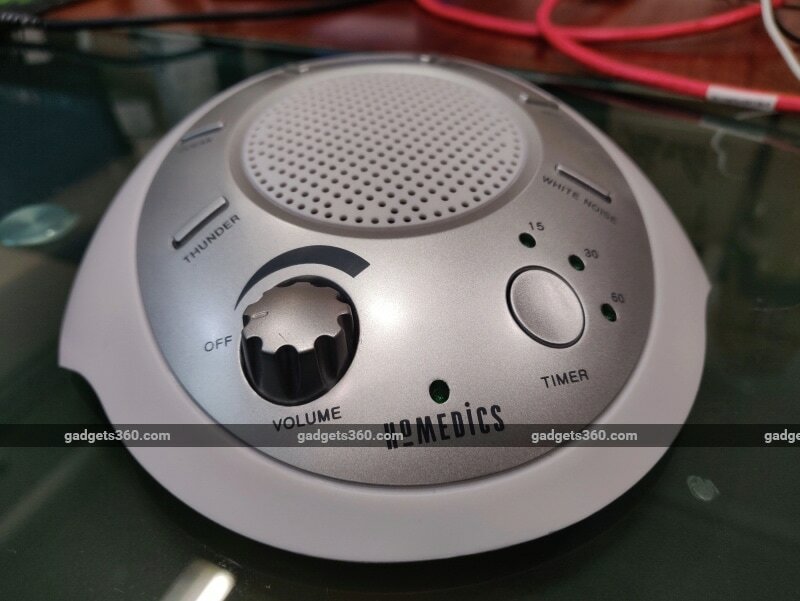 1,790 HoMedics SoundSpa, a ‘white noise' machine made by an American company that specialises in wellness products. The SoundSpa is rather simple in its approach, and promises to help people (including babies) sleep better. Is it truly as effective as it seems? We decided to find out. With a focus on portability and ease of use, the HoMedics SoundSpa is simple but effective in its design. The device is essentially a small speaker with its audio tracks built in; there's no external connectivity or method of playing your own music. While the plastic body might seem a bit tacky and lacking in durability, it serves the purpose and feels sturdy enough for tabletop use and the occasional trip out of town. All of the controls are at the top of the SoundSpa, positioned around the speaker grille. A knob controls the power and volume — it ‘clicks' on and off just after reaching the lowest volume level. Six buttons let you choose the audio track being played, and there's another button that lets you set a timer for the playback with options of 15, 30 and 60 minutes. If you don't use the timer, the device will keep playing the track until you switch it off manually or it runs out of power. The six pre-installed ‘tracks' are supposed to be soothing sounds that can help you sleep. These are Thunder, Ocean, Brook, Summer Night, Rain, and White Noise — all the names are self-explanatory, and the audio tracks are fairly accurate to their names. The tracks loop uninterrupted, so you won't notice any variation or jarring in the sound. 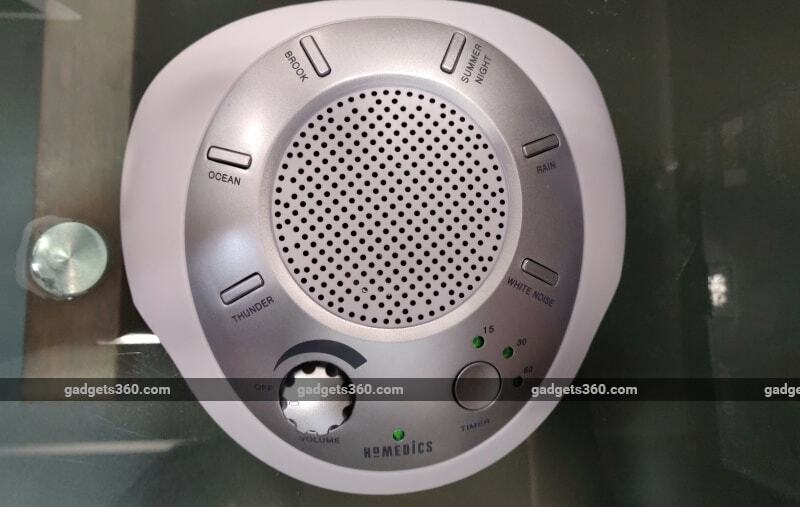 There are also two dull indicator lights on the HoMedics SoundSpa, the first of which will let you know when the speaker is on, and the second to show you what the timer is set to. The HoMedics SoundSpa can be used either plugged in to a power outlet, and the sales package includes a power adapter. You also have the option to insert four AA batteries and use the device on the go, which adds some versatility to the SoundSpa. The HoMedics SoundSpa works as advertised: it plays soothing sounds. Depending on what you like or what might help you sleep better, you can choose from any of the six tracks available. 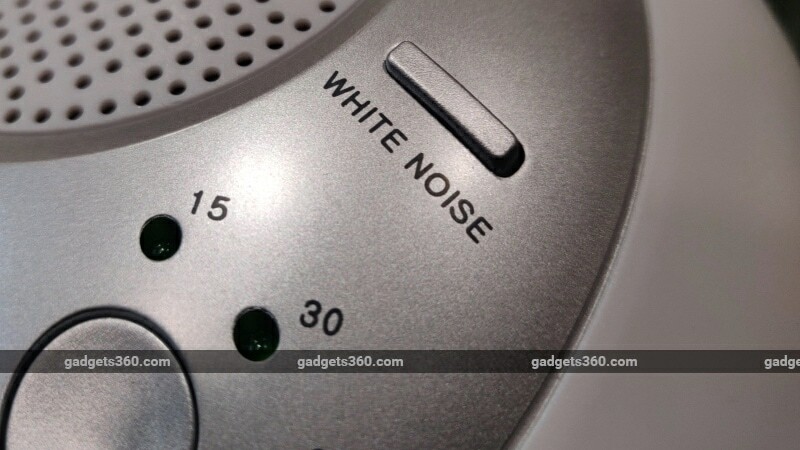 The most effective one in most cases is the actual white noise, which is also said to help fussy babies fall asleep. HoMedics claims that babies are calmed by white noise, and we were able to test this out with a 4-month-old baby. It did indeed calm the infant and help it fall asleep, and offered a viable option to just finding an appropriate white noise video on YouTube to play in the background. What works for you will be very subjective, and some people are irritated by white noise. In these cases, the nature-based sounds might help. The Ocean and Rain tracks appealed to us in particular. The volume can be adjusted depending on the distance between the user and the SoundSpa. At the highest level it can get very loud, and we were happy with a lower level in most cases. The timer is a useful feature, since it will help you keep control power consumption. Although you need not set a timer, it will automatically turn off the machine while you're presumably asleep. You have the option to set the timer at 15, 30 or 60 minutes, depending on how long you think you'll take to fall asleep. In our review over the course of 10 nights, we did experience some benefit from the HoMedics SoundSpa, but it's difficult to objectively describe how much of a difference such a product makes. White noise and other soothing sounds are regarded as being effective in helping people sleep better. However, the usefulness of products such as the HoMedics SoundSpa entirely depend on what works for the user. If you have a baby at home, or you know that soothing sounds help you fall asleep, the HoMedics SoundSpa could work for you. The HoMedics SoundSpa is inexpensive, has the benefit of portability at just 390g, and is very easy to use. With all of that in mind, it might be a good gadget to add to your home if you need help falling asleep.